September 9th, 2014 | Faces of Wheaton. Since its founding in 1945 by Earnest S. Wheaton, one thing has always come first at Wheaton World Wide Moving – the customer. The customer-first philosophy is the cornerstone of Wheaton’s success as its employees take great pride in ensuring that each customer moved has a positive relocation experience. 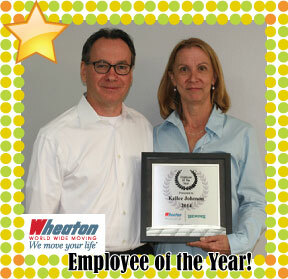 As such, Wheaton employs individuals who support and share its customer-focused philosophy. One individual that has exemplified the “Wheaton” way and the is Kellee Johnson. Wheaton World Wide Moving CEO Mark Kirschner announced Kellee Johnson as the Employee of the Year at a staff meeting this morning, Sept. 9. “I was completely shocked when they said my name because there was some pretty stiff competition,” Johnson said. Johnson joined Wheaton World Wide Moving in 2008 and is known as a dedicated, loyal worker throughout her department in accounting and revenue. Johnson consistently exceeds the production level established for her position as an audit analyst. Johnson earned the Employee of the Quarter for Q2 (October – December) because of her excellent work ethic. Below are photos from the announcement earlier today. There are also videos from the meeting on the Wheaton World Wide YouTube Channel. Congratulations to Kellee and thank you for your hard work through the years for a well-deserved honor of Employee of the Year!